The euro traded largely sideways during the day. It first moved upwards for 60 pips, retracing 61.8% of the previous decline, then swinging up and down within an increasingly converging range. The main count remains exactly the same. If price moves below 1.1724, the euro will likely move downwards to reach between 1.1704 and 1.1636, while remaining ideally below 1.1815. Elliott Wave chart analysis for the EURUSD for 25th September, 2018. Please click on the charts below to enlarge. Black wave (2) is forming a zigzag labeled blue waves A, B and C.
Blue wave A is forming a leading diagonal labeled pink waves i through v.
Pink waves i, ii and iii are complete. Each formed a zigzag labeled green waves (a), (b) and (c). 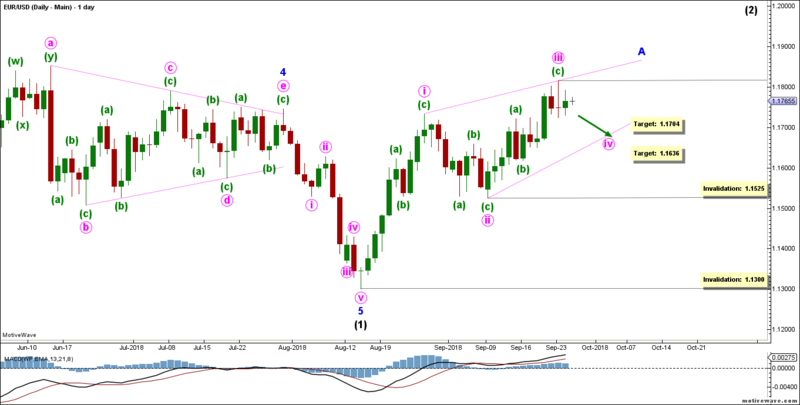 This count expects the euro to move toward the downside to complete pink wave iv. This will be confirmed by movement below 1.1724. At 1.1704 pink wave iv would retrace 38.2% of pink wave iii, then at 1.1636 it would retrace 61.8% of its length. 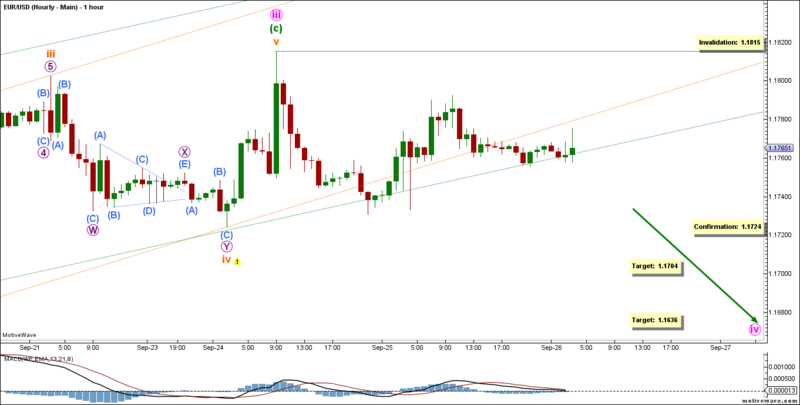 This wave count is invalidated by movement below 1.1525 as pink wave iv may not move beyond the start of pink wave iii. This main hourly count sees that pink wave iii is complete and pink wave iv is forming a zigzag labeled green waves (a), (b) and (c). The movement from the beginning of pink wave iv may have complete green waves (a) and (b), or just the first two waves within green wave (a) itself. I’d like to wait another day to see if the price action will clarify this. This wave count is invalidated by movement below 1.1525 as pink wave iv may not move beyond the start of pink wave iii, as well as by movement above 1.1815 as green wave (b) of this zigzag may not move beyond the start of green wave (a).